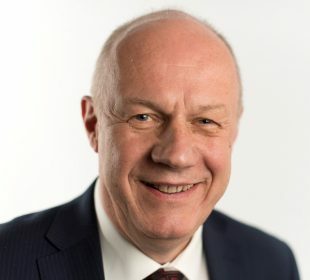 Many of you will have seen the announcement from the First Secretary of State, Damian Green outlining the next steps on reform of adult social care. As people are living longer and the population ages, the Government recognises the need to reach a long-term, sustainable solution to providing the care older people need. As part of this work, the Government has begun a process of engagement in advance of a Green Paper to ensure it reflects a wide range of views and requirements. Government will work with independent experts, stakeholders, including social workers, occupational therapists and most importantly, users and carers to shape the long-term reforms that will be proposed in the Green Paper, to be published by summer 2018. To achieve reform where previous attempts have failed, we must look more beyond social care services, and our vision for care must also incorporate the wider networks of support and services which help older people to live independently. This should include the crucial role of housing and the interaction with other public services, but more broadly focus on the essential role of people who provide unpaid care and how our society supports carers in a sustainable health and social care system. It must also consider how care is provided at present and challenge the system to embrace new technology, innovation and workforce models which can deliver better quality and value. The place of social work and the vital practice approach that social workers contribute, together with other existing care professionals and potential new roles, should be at the heart of that vision. 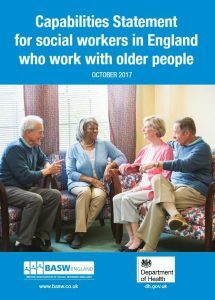 It's a vision I set out in part in my foreword to the capability statement for social workers who work with older people which we collaborated on with the British Association of Social Workers (BASW) with funding from the Department of Health. Many have rightly said that social care is not about older people alone, and work should recognise those younger adults with care needs who can face a range of challenges. Whilst the Green Paper will primarily look at support and care for older people, it will of course impact on the system as whole, for all ages. But moreover, Government is also establishing a parallel programme of work to ensure that the perspectives and needs of working-age adults who use social care services are considered in their own right, and that the opportunities for reform for this group are not lost amid discussion of how we meet the needs of our ageing population. Government has invited a list of independent experts to contribute their views as part of this process, who represent significant expertise and diverse perspectives. 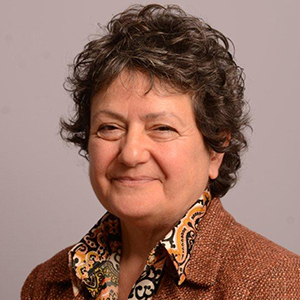 I am particularly pleased to see social work and local government experience represented, and it is fantastic that Imelda Redmond, national director of Healthwatch England, has committed to bringing the perspectives of people who interact with services into the discussion. In addition to hearing from these experts, the Government is also engaging more broadly with people who use care and support, carers, the public, and representatives from across the sector to underpin the development of the Green Paper. When published, it will of course be subject to a full public consultation, providing further opportunity for anyone who wants to give their views. I hope many of you will make the most of the opportunity to participate in this process and ensure that the social workers can influence and contribute to shaping the social care system that promotes people’s rights and ensures they can have the best possible lives and be fully included as valued citizens in our society. The Green Paper presents a unique opportunity to build consensus around reforms which can last. There is no escaping that building a sustainable care and support system will require choices about what that system should provide and how it is paid for. But getting this right promises a better system that everyone can have confidence in, where people understand their responsibilities, can prepare for the future, and know that the care they receive will be to a high standard and help them maintain their independence and wellbeing. I look forward to a valuable and thought-provoking public debate. Adult social work supervisors – what do they need to lead and support others? Recently my experience of social care has been of trying to get the right support for my 95 y old mum in law. Mostly blind & wobbly of leg, living on her own it became a stressful nightmare of being long distance carers. The no of times she fell and spent hours alone on the floor. Getting reliable care and persuading mum in law that paying out her savings for care when she was already reluctant to accept it was almost impossible. Social services were kind but bound by rules and I guess cash strapped. This week I myself had a Care Act assessment. The second this year. I nearly 66, have physical problems but am most severely impacted by my mental health problems. I am a risk to myself in the most basic of way in that I am suicidal. I am the sort of person that although I'm classed as elderly that should not be forgotten. When I rang social services after I lost my quite substantial package of social care in Feb as a result of being discharged from mental health services I was told we only deal with the elderly and disabled. You are not in that category go to mental health services but they had discharged me. Until I lost my social care budget I hadn't realised how it was keeping me and importantly my family afloat. I had daily carers, I had respite stays available, I had a budget to do activities that made life a little better and I could have a companion to do that. My assessment prior to this year said I had critical needs that could not be met by my family. It helped keep me alive yet often mental health needs are at the bottom of the pile. After much fighting I had another Care Act assessment in the summer and I really struggled to shoe horn my needs into the criteria. Where did I fit? Yes I could physically get up but I had no desire to get out of bed. Motivation doesn't feature and so the social worker worked her way thru the list. My husband spoke practically in tears trying to explain how it was impacting him. His carer's assessment supplied him with some counselling session when actually what he needed was to feel he had some support with being a 24/7 guard to his increasingly suicidal wife who had lost all her support from both social and mental health care with immediate effect. Reading about the Care Act although it mentions mental health it almost seems air brushed out in practical terms. When my assessment came back I scored no higher than 2, 7 being the highest and had no needs that my husband couldn't meet. From critical to no needs in about 3 months. My husband crumpled before my eyes. He's lost lots of weight, started drinking too much, been diagnosed with depression himself. He can't cope and is now going to leave me. My decades long marriage in tatters. He is technically also an elderly person. My family have told social services about the situation. We have pleaded for help. Other organisations have raised at least 6 safeguarding reports which have been passed on to mental health services who then filed as no action required. Part of me who knows that the council are in dire financial straits wonders if the bar had been raised for access to social care especially for the non frail elderly - the bed blockers. What I found was as a person with complex needs physical and mental there was no joined up care. Constantly met with 'that's not my remit' passing me on to somewhere else that took a message and never called back. No one has known what to do with me or my family so we were ignored and now we've hit crisis. So finally I had another assessment this week. Same social worker. I said I don't know how to get across to you that my needs are greater than telling me to organise a Link scheme visitor. I want to feel well enough to be that visitor. I don't know how to fit my mental health needs into these same questions I heard in the summer. I want it so that my husband isn't so angry and frustrated and ill that he frightens me with his anger. I want to feel that I have somewhere safe because at the moment I don't feel that. I haven't heard back yet but I'm not feeling that positive. I've said the same things why would I get a different outcome. Sorry for the lengthy comment but it's really important that both receivers of social care and their carers are heard in this process. Really crucial that it's not just about the frail elderly please. My social care was my lifeline an important part of my 'care' package as it was to my mum in law. Thanks for this helpful summary re the Green Paper Lyn. I'd like to know how I may engage with the process of consultation and am happy to be involved in any relevant activities. Insights, updates, and personal reflections from Lyn Romeo, Chief Social Worker for Adults at the Department of Health.